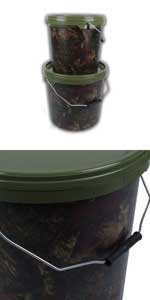 A new range of hard-wearing plastic Bait Buckets - Finished in the unique Gardner Camo pattern. Made from extra tough material for lasting performance. Features sturdy metal carrying handle and plastic hand grip for extra durability and strength. Follow the link to view a range of Buckets. Buy your Camo Buckets Today.